Beauty Professor: Video: What's in My Makeup Bag? What do you find endlessly fascinating? For me, one of the most riveting things to do is to take a peek inside someone's cosmetics bag! There is just something so captivating about exploring a personally-curated collection of essentials...I generally learn more about the person and am inspired by the discovery of new beauty products. I am excited to share a video that offers a glimpse into my own makeup bag; I hope you find it intriguing! Cosmetics Bag Close Up: As mentioned in the video, I picked up this Saint Laurent makeup bag from Italian online retailer Luisaviaroma, which specializes in a plethroa of luxury goods. The stunning jet black leather is soft yet sturdy (love the flat bottom--it stands upright on its own) and the gold zipper pull features the iconic interlocking "YSL" and tassel for immediate chic. It is large enough to comfortably fit all of my "must-haves" yet small enough to fit comfortably in a handbag. Simply beautiful! The pouch comes in an opulent dust bag (lined for additional protection). Sleek YSL zipper pull and tassel for added flair. The inside features a large main compartment and small side compartment for eyeliner, lipliner and small brushes. Yes, it really does hold this much. Charlotte Tilbury Luxury Palette in Dolce Vita + Surratt Beauty Petite Smoky Eye Brush. Brushes from Surratt Beauty + Jenny Patinkin. Bottom Line: I hope you found this video entertaining, enlightening and inspiring and I would love to hear what is in YOUR makeup bag as of late...do share! Good things ahead, including a host of new product releases for Spring 2016...can't wait to share. I am also at IMATS LA this weekend so take a peek at my Instagram for the visual updates of this makeup lovers-haven! Labels: arcona eye dew, By Terry, Chantecaille, charlotte tilbury, edward bess barely, la prairie, louisaviaroma, natasha denona, saint laurent, what's in my makeup bag? Thank you for mentioning which product you use to achieve such a naturally dewy glow under your eyes :) Thanks for letting the secret out! My pleasure, Holly! I loved your question and was beyond happy to share! BP! I adore your videos. Jethro is so cute and fluffy! The YSL bag is amazing as it is every single piece you have in it. 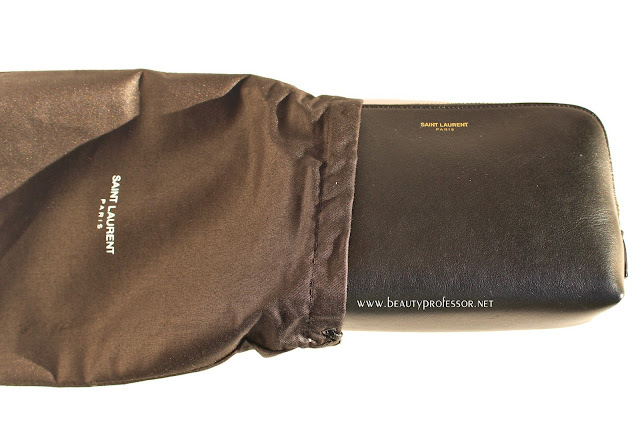 Perfectly tailored makeup bag. Many thanks to you, dear Wefadetogray! I am so happy you enjoy my videos...I have a blast making them!